Our final gift suggestion for today is not so much a gift or a specific store, but a heads up about a Facebook page. In this case, it’s a Facebook page devoted to Downtown Charleston and the stores that will be open and participating in Small Business Saturday, which is the Saturday following Thanksgiving, and the day after Black Friday. This November 24 you can head to the bosom of Downtown and enjoy all sorts of wonderful shopping experiences. You may find books, music, jewelry, furniture, art, art supplies, clothes, shoes and knacks of the knick variety. Like and visit the Downtown Charleston Shop Small page and you’ll discover which stores are running what specials, who has the best discounts and which place has the neatest stuff hot off the truck. This page was created by the Downtown Charleston Business Association, and will let you know the latest about The Purple Moon, Taylor Books, Stray Dog Antiques, The Art Emporium, Tony the Tailor, Delfine’s Jewelry and the dozens of other locally-owned and operated stores and boutiques that make Downtown Charleston such a vibrant place to shop. 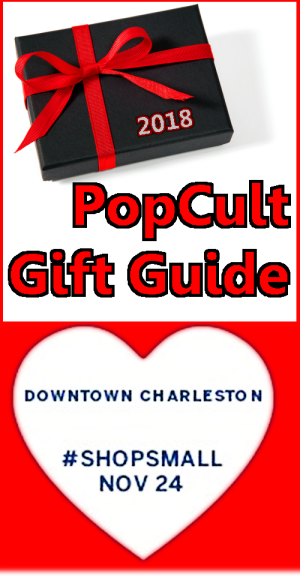 I will be including many of the participating businesses (and many that I haven’t the space to mention here) in the coming weeks in The 2018 PopCult Gift Guide, but this page will give you additional information and more details. And you can use the page as a reference all through the holiday season, so click on over and check it out.